Beat the heat with energy drinks, ACs and hospitality! You know there is something wrong when new migrants to the city from the North, who previously scoffed at Bengaluru’s pretensions to winter, complain about the heat in the summer. It is indeed a harsh summer in the city this year. Bengaluru, which has always escaped the heat that torments the hinterlands by virtue of its elevation and ‘table-top’ geography, has turned into an isolated island of heat in the the summer months. For one, corporate employees taking a post-lunch stroll inside their tech parks have all but disappeared as the heat is turned up, preferring to lounge in climate-controlled offices instead. Families have taken the unprecedented step of installing air-conditioners in their homes, an unimaginable climb-down for a city where people once idly boasted of not using ceiling fans in their houses. As the rising temperature becomes another facet of life in the city, people are trying various ways to cope with it. Athira Varghese, who takes a two-wheeler to work everyday (an uninviting prospect in Bengaluru, even without the heat) tries to get to the office before the heat kicks in and only steps out after the sun goes down. “Always carry an umbrella or scarf if you need to step out,” says Priscilla Dvikiruba, who also takes in plenty of juices and coconut water to beat the heat. Vinod Kumar. 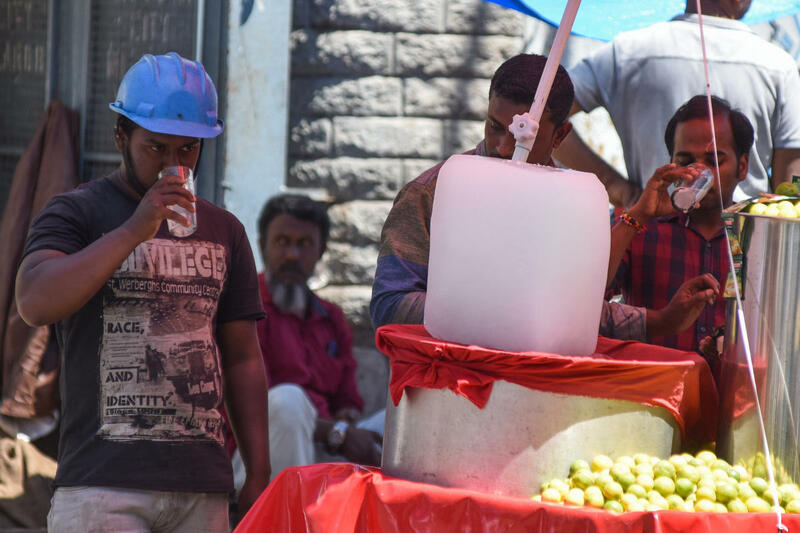 who stays in Kammanahalli and is a senior director of HR at Khoros, an IT firm in Bellandur, says that his company works to ensure employees are “well-hydrated and healthy.” “We have fruits and juices… we also have fruit infusers so people can stay hydrated,” he says. Sandhya George, who stays in Langford town, also ensures that there is a stock of fresh juices in the house. People have resorted to carrying energy drinks, or adding glucose to water. In street corners, people sip on overpriced coconut water. Those who prefer more potent refreshment have switched to beer, notwithstanding its properties as a diuretic. Despite the measures they take, many people are surprised by the intensity of the heat. “It burns your skin, that is the worst part. It is like Delhi,” says Sandhya, who has experienced the infamous summer in the national capital first-hand. Sandhya has now installed an AC in her top-floor apartment at her building, because the heat was unbearable. Vinod Kumar blames the rise of glass-fronted buildings for the rise of heat in certain parts of the city. Despite living in a residential area with trees, he has had to install an AC in his home as well. Akash Subramanian, who grew up in Bengaluru, also drew unfavourable comparisons to Delhi. “I can feel the difference over the past two to three years. It feels like it is getting a couple of degrees hotter each year. I am not used to this kind of heat,” he says. So, how else does one bear the brunt of this summer? In villages in South Karnataka, it is customary for households to leave a pitcher of buttermilk outside their homes during summer, for people to quench their thirst. Local culture dictates that it is uncouth to charge money for this. In some of the more affluent neighbourhoods of Bengaluru, this tradition continues, though the buttermilk is replaced with a can of water. A couple of days ago, an electrician visiting home declined a customary offering of tea “Ee bisilu nalli?” he simply said. Moments later, he turned up with two cups of buttermilk from the shop next door and refused to take money for it. “Maybe next time,” he said. More than ACs and fruit juices, maybe what we really need to beat the summer is old-school hospitality and a consideration for fellow beings, whether in the home or the street.